Ex aequatoria aliquid novum and this time it's a new hummingbird. A little stunner, newly named Oreotrochilus cyanolaemus, or the blue-throated hillstar, was only just spotted in 2017 in that hotbed of biodiversity and speciation, Ecuador.¹ Rare, its range is restricted to El Oro and Loja Provinces in the southwestern corner of the county between the Jubones-León river valley on its north and the lower Andes of the Puyango-Catamayo drainages on its south. Sadly, Oreotrochilus cyanolaemus is probably already critically endangered. The estimated population of these sapphire-emblazoned beauties may only be 250 to 750 individuals. 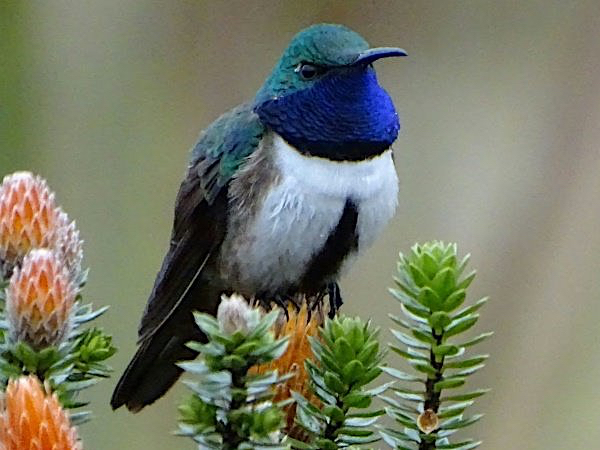 “This striking discovery confirms that life in the high Andes still holds many secrets to be revealed", enthused a hummingbird expert from the University of New Mexico, Christopher Witt. With no disrespect to the excited ornithologist, I had to giggle a little at this one. It was mostly in agreement, though, because it comes as no surprise. There are actually a number of Fuchsia species strewn about the upper hills and slopes of the Andes in Loja. 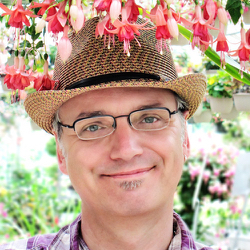 Fuchsia ayavacensis, F. campii, F. harlingii, F loxensis, F. scherffiana, and F. summa are all endemic to the area. F. campii was first described in 1995. Only as recently as 2007 a seventh species, F. aquaviridis, from about 2,900 to 3,100 meters (9,500 to 10,000 feet), was added to the list. There are probably more. Hopefully not critically endangered but the same pressures of deforestation that are on the hummingbirds are on the fuchsias. The race is on for both. 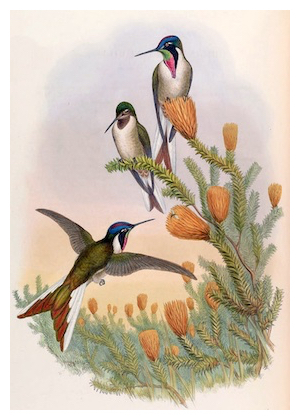 Hillstars are very interesting hummingbirds. They inhabit colder, higher altitudes of the Andes in areas of temperate and alpine grasslands, scrub and woodlands. At heights anywhere from 1,200 to 5,200 meters (3,900 to 17,000 feet) depending on the species. They also feed mainly, if not entirely in some species, on the flowers of various Chuquiraga shrubs (Asteraceae). No Fuchsia for hillstars, as far as I am aware. But who knows. Fuchsia campii is found in grasslands or moist mountain slopes in Loja at a similar altitude range as the newly-discovered Oreotrochilus cyanolaemus. It wouldn’t be surprising if they sneak in some delicious nectar of Fuchsia now and then. They are hummingbirds, after all. Hummingbirds are so closely associated with fuchsias in people's minds that they're frequently depicted together in art. 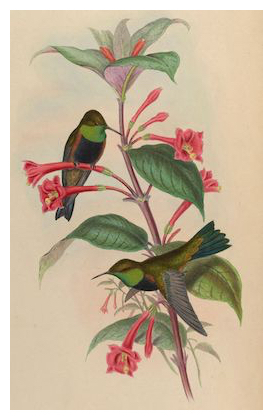 The marked preference of Oreotrochilus for Chuquiragam, however, makes this beautiful 1861 illustration of a pair of black-breasted hillstars, Oreotrochilus melanogaster, perched on the flowers of Fuchsia macrostigma all the more remarkable. Black-breasted hillstars are found in the mountains of central Peru from 3,500 to 4,400 meters (11,500 to 14,400 feet). F. macrostigma is native to the Cordillera Occidental of Colombia and Ecuador, occurring sparsely in moist cloud-forest thickets on its Pacific slopes. At much lower elevations from 1,000 to 2,500 meters (3,300 to 8,000 feet).